Project Ego’s 118-foot length is modest by superyacht standards, but designer Mauro Giamboi uses every inch of the luxury catamaran’s 42-foot-wide beam to create a vast interior. He designed Ego for a buyer seeking an elegant but livable space, one that is more urban loft than suburban trophy home. The master and VIP staterooms on the main deck and two guest cabins in the port hull provide closer proximity to the water than those on most superyachts. 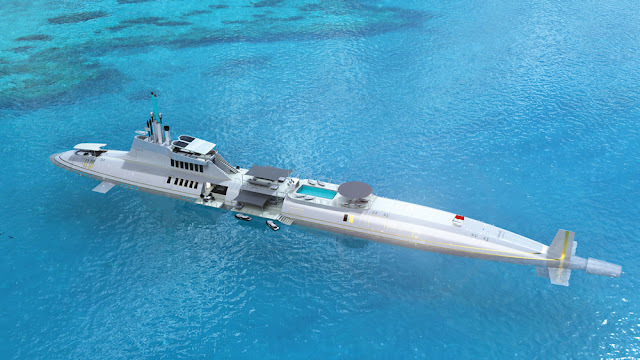 One of the coolest features of Ego is the swim platform at the stern, which separates at the center to allow swimmers and divers instant access to the sea. 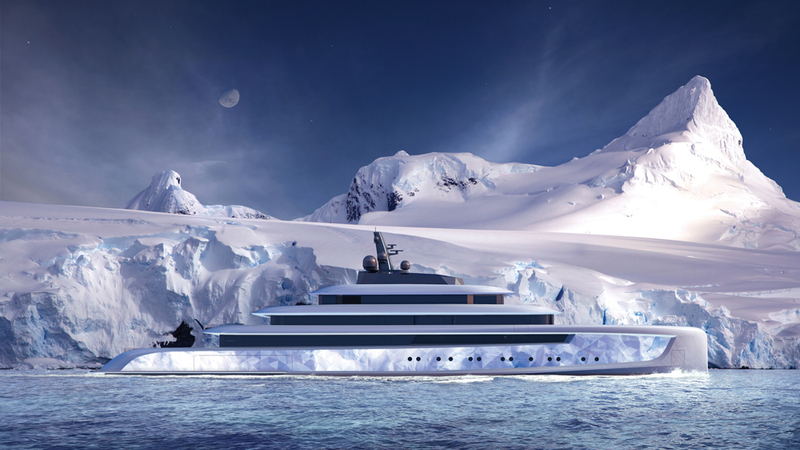 Project Moonstone takes onboard illumination to a new level. 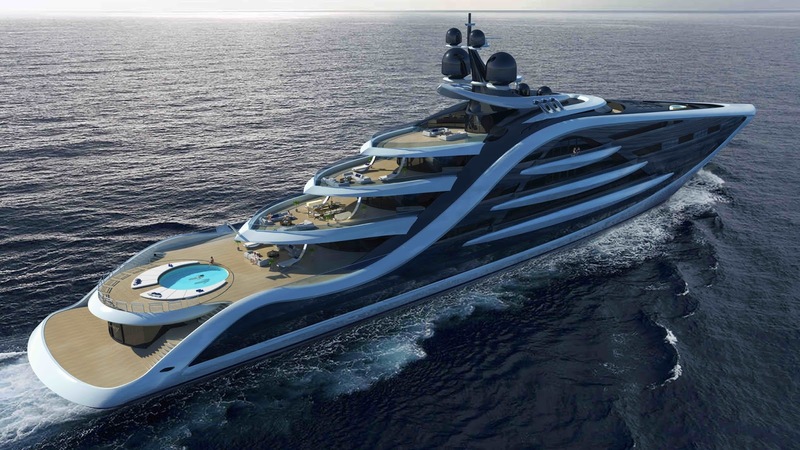 The 295-foot concept, a joint project by Oceanco and Van Geest Design, has a faceted hull that reflects sun and sea like a diamond. At night, 300 individually dimmable LED lights built into the facets provide customized light shows. The swimming pool features dimmable lights built into a transparent wall. Moonstone isn’t just glitter: It’s built around the proven 295-foot Oceanco hull and includes a complete owner’s deck, a full gym and spa, a cinema, and a touch-and-go helipad. Andy Waugh’s 427-foot Epiphany exemplifies his belief that classic design is a “simple sophistication” that comes by resolving conflicting factors of technology and ergonomics. Epiphany’s undulating profile and stair-step decks are indeed clean-cut in their own bold way, while its oval-shaped beach club is elegant in its simplicity. 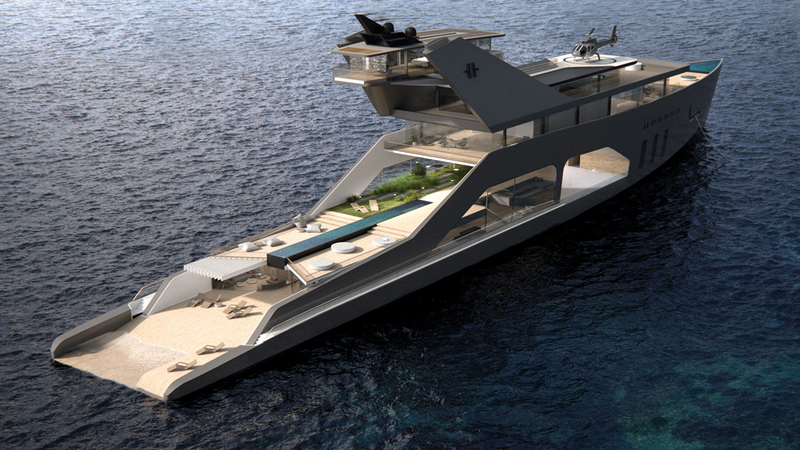 Waugh created an owner’s deck that would be the envy of any yacht owner. It includes a private library and balcony overlooking the lounge below, a private foredeck, and a palatial master suite with skylights. Waugh believes that limiting crew areas to the upper and lower decks frees designers to optimize guest accommodations. Migaloo does not use the word “submarine” to describe its M7, which ranges in size from 738 to 928 feet. ‘Submersible yacht’ is a better way to designate the vessel. The M7, built to U.S. naval submarine-class standards, has an exterior inspired by the ‘Zumwalt’-class destroyer. But the largest version’s 38,000 square feet of interior space (22,600 for the owner) can be whatever the owner wants. Bored with the local yacht club? 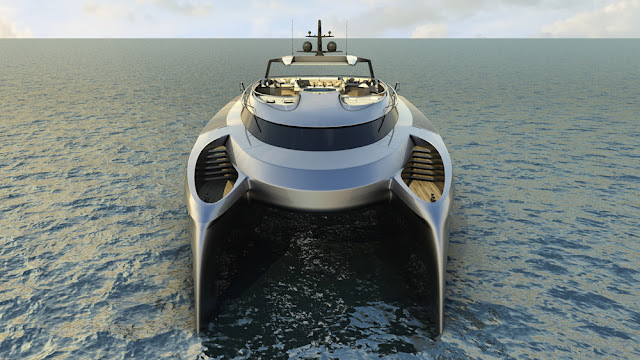 The M7 can descend to 1,500 feet, cruising at 20 knots beneath the water. On the surface, it will blast along at 40 knots.